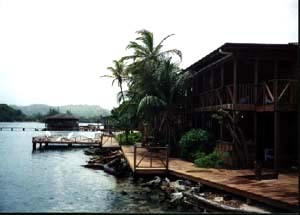 Cocoview Resort is located on its own small island just east of French Harbor in Roatan, Honduras. Views from all rooms overlook the sea. 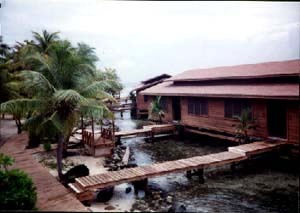 Many of the rooms are built on stilts over the sea. There is an air conditioned workout room and a wonderful masseuse that comes twice a week. The rooms are comfortable, and the meals are excellent. The entire staff does an incredible job of making every guest totally at home. 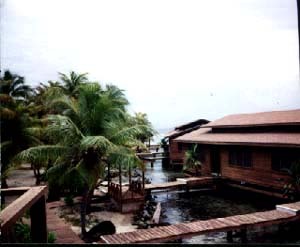 In August 2001, my wife, Laurie, and I spent a week at Cocoview, often diving as much as five time/day. At 8:30 AM, our Captain, Reuben, and our totally amazing divemaster, Enrique, took us out on short trips to awesome walls. 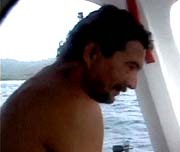 Enrique found a pipefish, a seahorse and a large mouth toadfish for us during our week. 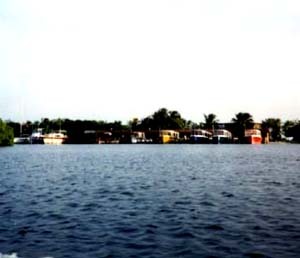 After about 1/2 hour surface interval, many divers chose to leave the boat to dive Newman Wall or the Prince Albert, from where one could easily swim back to the resort. The Prince Albert is one of the best wrecks I've ever dived, with many easily accessible rooms, inhabited by glassy sweepers. Other residents of the Prince Albert include a very friendly Nassau Grouper and a Green Moray Eel. About 2:30 PM, after a wonderful lunch and some rest, the dives resumed. This time the dropoff dive was either Cocoview Wall, the Prince Albert or its neighboring airplane wreck. After dinner or evening activity, such as hermit crab races, BBQ on the quay or a Slide Show and video by a great photographer, I chose to do a night shore dive on 3 of my evenings. I was greeted by Octopi, many lobsters and other friendly denizens of the not so deep. Only two things marred my vacation, no-see-ums and sandy feet. 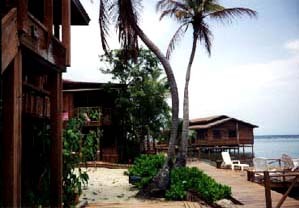 A few more decks, strategically placed around the resort would reduce the amount of time crossing the sand. This may sound like a truly spoiled complaint, but on Roatan, you want to spend as little time as possible on the sand. You definitely don't want to drag any of it back to your room. The sand fleas, or no-see-ums, are deadly. I had at least 70 itchy red blotches on my body by the end of the week, and others of our group were hit worse. I was constantly covering myself with wonderful smelling "Cactus Juice," but I must have missed a few spots. Meanwhile, everything else was wonderful, and don't miss the Iguana farm or the Parrot preserve, which are some of the land activities offered. Also almost every day there were special trips or picnics planned. Enjoy this fine resort.